Take on rugged Canadian winters, crowded cities and whatever else life throws at you, thanks to the 2017 Ford Escape. It comes in three models, called S, SE and Titanium. This special SUV packs a serious punch, while still sipping fuel, so you reduce emissions and spend less time at the pump. You also enjoy simple controls, advanced onboard technologies and practical comforts, ensuring this vehicle will keep you happy during daily commutes and long road trips alike. Just like the model lineup, Ford offers three different engines for the Ford Escape. 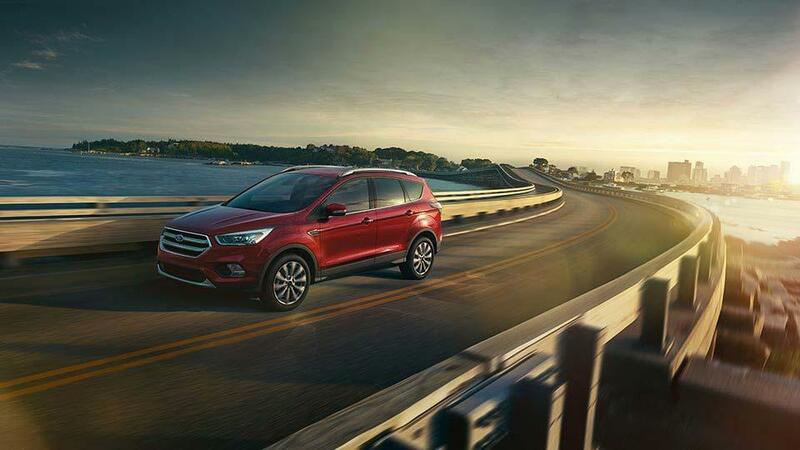 Standard for the Ford Escape S, a 2.5-litre four-cylinder engine with intake variable cam timing technology produces a solid 168 horsepower and 170 lb.-ft. of torque. It can only be combined with front-wheel drive. You can also get a 1.5-litre EcoBoost four-cylinder engine as an option on the S, or the standard engine for the SE. It uses turbocharging and direct injection to save on fuel, while still putting out 179 horsepower and 177 lb.-ft. of torque. Front-wheel drive is standard with this engine, but you can pair it with four-wheel drive. Finally, a 2.0-litre EcoBoost engine with a twin-scroll turbo and direct injection is standard for the Titanium, and available for the SE. It produces 245 horsepower and 275 lb.-ft. of torque, for truly exhilarating performance. Front-wheel and four-wheel drive are both available for this engine. Each engine works with a 6-speed SelectShift automatic transmission. If drivers want to change gears manually, they can do so with the paddles mounted to the steering wheel, making it incredibly convenient. Enhancing performance further is torque vectoring control, a feature included on all models. This technology balances out torque distribution to the front wheels. It helps with keeping on your intended path, even in slippery conditions. Because the Ford Escape includes features such as airbags and strategic reinforcements to the frame, you can be confident it will perform well in a crash. Even better, advanced technologies help mitigate or altogether avoid accidents. A great example of these available driver assistance technologies is the lane-keeping system. It monitors for unintentional drifting, warning you of the danger so you can correct it. The technology also applies directional torque to the steering system, helping you guide the SUV back into the lane without incident. You can also get a blind spot monitoring system, cross-traffic alert and adaptative cruise control. Everyday tasks are easier with the Ford Escape. Adding a foot-activated, hands-free power liftgate means you can load items into the rear without putting those things down on the ground. Instead, you just wave a foot under the rear bumper momentarily, triggering the liftgate. All models come with a windshield wiper de-icer, which is especially useful during the harsh Canadian winters. Heating elements in the base of the windshield safely melt ice and snow off the wiper blades in 10 minutes or less at outside temperatures as low as -27 degrees Celsius. Make an appointment with our dealership today. It's the best way to experience these and the many other features included in the Ford Escape.